The Irish revolutionary leader and statesman Eamon De Valera served as prime minister and later president of Ireland (1959-1973). Eamon De Valera was born in New York City on October 14, 1882. In 1885, after the death of his Spanish father, he was sent to live with his Irish mother's family in Country Limerick. He graduated from the Royal University of Ireland in 1904 and became a mathematics teacher. De Valera was an ardent supporter of the Irish language revival movement and also became a member of Sinn Fein and the Irish Volunteers. After the failure of the 1916 insurrection, he became the senior surviving rebel leader when his death sentence was commuted because of his American birth. Released by the British government in 1917, he was acclaimed in Ireland as the leader of the revolutionary independence movement. He became president of the Irish Republic established by the separatists after their victory in the election of December, 1918. In June, 1919, De Valera traveled to the United States, where he won much sympathy and financial support for the Irish cause. He returned to Ireland in December, 1920, as the guerrilla war with Britain was moving into its final phase. De Valera accepted British proposals for a truce in July, 1921, and sent a delegation to London to negotiate a peace settlement. The British refused to accept his compromise plan for an Irish republic in external association with the British Empire and offered instead dominion status for Ireland, with the right of exclusion for loyalist Northern Ireland. In December, 1921, the Irish delegates accepted these terms, believing them to be the best obtainable without further war. De Valera, however, denounced the treaty as a betrayal of the republic which would mean continued subjection to Britain. Despite his protests the Republican Parliament, Dail Eireann, approved the treaty by a small majority in January, 1922. Continued dispute over the settlement led to civil war in June, 1922, and supporters of the new Irish Free State defeated the Republicans in May, 1923. After the civil war De Valera led the Republican opposition to the pro-treaty government of William T. Cosgrave. In 1926 he broke with the extreme Republicans and founded a constitutional opposition party, Fianna Fail, which entered the Dail in 1927. Fianna Fail won the 1932 election, and De Valera formed a government which lasted for 16 years. As prime minister, he removed the last remaining restrictions on Irish sovereignty imposed by the treaty. His refusal to continue payment of land-purchase annuities to Britain led to an economic war between the two countries, which enabled him to pursue plans to make Ireland more self-sufficient economically. His government also extended social services, suppressed extremist threats to the state, and introduced a constitution in 1937 which made the Free State a republic in all but name. In 1938 agreements made with Britain ended the economic war and British occupation of Irish naval bases retained under the treaty. De Valera was unable, however, to end the partition of Ireland. De Valera had been a strong supporter of collective security through the League of Nations, but he maintained a policy of neutrality, with overwhelming popular support, throughout World War II. In the postwar period Fianna Fail alternated in power with two interparty governments, the first of which formally established the Irish Republic in 1949. 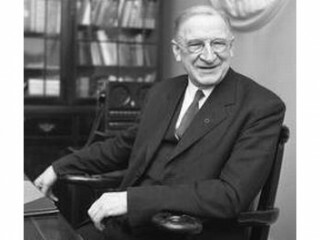 Returned to office with a decisive majority in 1957, De Valera retired from active politics in 1959, when he was elected president of the republic. He was reelected in 1966, the fiftieth anniversary of his entry into Irish political life. Failing eyesight troubled him from the 1930s onward and left him almost blind before his retirement from active politics in 1973. Concurrently, he held the post of Chancellor of the National University of Ireland from 1921 until 1975. He died on August 30, 1975. The wisdom of De Valera's policies has been widely disputed but not his unequaled impact on Irish life in the twentieth century. The charismatic appeal of "Dev" was firmly based on his understanding of the outlook and way of life of a large section of the Irish people and on his fellow citizens' great respect for his ability, austere dignity, and idealism.